Between meager wages, overcrowded classrooms, limited funding, and a host of other headaches, teachers have plenty on their plates. But as if they don’t already have enough to worry about—because educating our children has somehow become an afterthought in the equation—the onus has now fallen on our educators to serve as sentries. Donald Trump has been vigilant in his support of arming teachers as a preventive measure (2018 was a record year for school shootings), and United States Secretary of Ineptitude Betsy Devos has expressed similar sentiments in the past. But as asinine as it sounds, armed teachers aren’t a figment of our imagination. They actually exist. And for students in Dublin, Ga., they’re actually the norm. To that point, the Atlanta Journal-Constitution took a glimpse into a day in the life of Laurens County—the first school district in the state of Georgia to issue guns to teachers. So I suppose I’ll be your tour guide as we explore this alternative reality together. As you might expect, the decision to arm teachers in Dublin followed last year’s infamous Parkland shooting, in which 17 teenagers lost their lives. And with paranoia and fear rampant throughout the country in its aftermath, Laurens’ superintendent Dan Brigman decided on a controversial solution. “I came to the conclusion that the best way to preserve the safety of staff and students and prevent loss of life was to arm some of the school personnel,” he told AJC. Also factoring into his decision was Laurens’ status as one of Georgia’s largest counties—which means it can take 20 minutes or more for deputies to properly respond to an emergency at a school. And while you’d presume that teachers would be averse to such a bold suggestion, it was an easier sell than you’d think. Of particular note, teachers who participate in this program are encouraged to confront danger—which the school explicitly emphasizes to those it has authorized to carry guns. 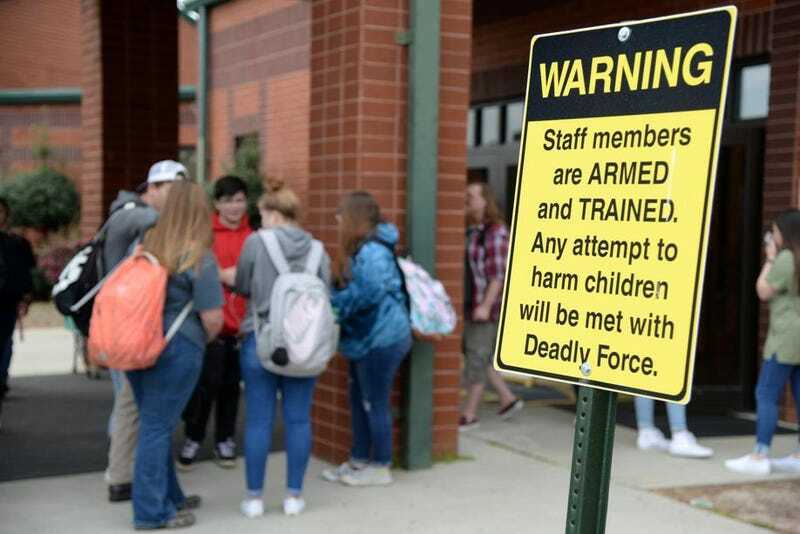 Several teachers or school staff members at each of the county’s nine schools – two high schools, two middle, four elementaries and one alternative school — either carry a concealed weapon during the school day or have the gun nearby, locked up. The system doesn’t have a school police force, but sheriff’s deputies patrol the schools. Additionally, all volunteers attended a five-day training course in the summer where besides firing at a gun range, they learned about “developing the right mindset and attitude” for participating in the program. One of the requirements is being “mentally ready to act” instead of second-guessing your actions. They must commit to periodic training, including time at the police gun range, team debriefings, drills and state re-qualification for use of semiautomatic pistols. And as for the artillery they’re carrying? The district won’t disclose how many educators are armed or what type of guns they carry, but the weapons were purchased by the school district via a bulk discount through law enforcement. Laurens might be first district in George to arm its teachers, but the Atlantic Journal-Constitution notes that there was a precedent set for that decision. But the decision has its fair share of detractors within the state as well. Meanwhile, school security experts like Michael Dorn—director of Safe Havens International, a Georgia-based nonprofit that’s the world’s largest K-12 school safety center—who has written 27 books on that very subject, doesn’t believe arming educators is the route to go. Dorn believes that if the decision is made to have armed personnel on site, teachers shouldn’t shoulder that burden. “I’d hate for them to have to make the decision to leave the kids to track down a shooter,” he added. But some students and teachers appear to feel otherwise and welcome the extra layer of security. “As long as the teachers are well trained, it can be a good tool for safety,” said Kristi Graham, who has a child in elementary school. “I say give the teachers AR-15s, too,” said Roy Huggins, a former student at West Laurens High School. AR-15s were the weapon of choice in the Parkland shooting. “Personally it makes me as a student feel safer to know that if a situation was to happen at our school we wouldn’t be unprotected,” said Ashley Boland, a student at West Laurens. Another parent, Natasha Richards, expressed concern over the validity of the mental health evaluations and weapons training teachers received. But Superintendent Brigman sounds resolute about his decision—despite the fact that a gun was stolen from a staffer’s car.